Hailed as unprecedented in scope and nature, the $3.5-billion, 400-hectare (approx 1,000 acres) Baha Mar mega-resort project on Cable Beach, New Providence, is scheduled for a grand opening December 2014. Almost midway through construction, the Baha Mar project is a mammoth undertaking, one that has seen its fair share of controversy and complications. But now, nearly two years after the project went vertical, the finishing line is in sight. 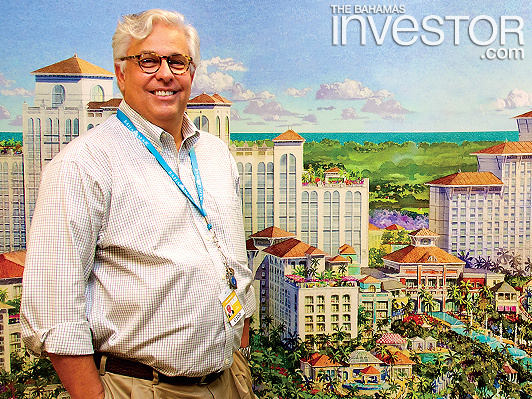 Charged with getting the massive development across that line is Baha Mar president Tom Dunlap. A construction industry veteran, Dunlap has been in the hospitality and resort business for 30 years. He joined Baha Mar in June 2010, being appointed to his current position in September last year after two years as executive vice president of development and construction. Prior to joining Baha Mar, Dunlap was president of US-based development company Revolution Places Development, which oversaw the construction of the $1-billion Cacique resort in Costa Rica. He was also a partner in East West Partners in California where he was responsible for the Ritz Carlton Hotel and residences associated with the ski resort at Northstar. But it was at Walt Disney Co where Dunlap cut his teeth and learned the intricacies of the industry. From 1990-2005, as vice president of Walt Disney Imagineering, he was intimately involved in the design and development of a wide ranging portfolio including resorts, cruise ships, terminals and hotels around the world. In an exclusive interview with The Bahamas Investor the recently installed president discusses how the project is progressing and describes some of the challenges presented by managing the construction of the largest resort complex in the western hemisphere. Q: What are the principal responsibilities in your role as president? A: I am now responsible not only for the delivery of the construction phase of the resort in time for the December 2014 opening, but also leading the efforts in recruiting, staffing and training and the opening of Baha Mar from the resort operations perspective. Q: You have been with Baha Mar since 2010. What progress have you seen in that time? A: It’s amazing what can happen in only a couple of years. 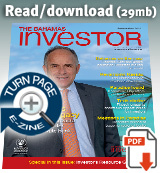 The focus of our attention in the third and fourth quarters of 2010 was mainly to get the loan closed. We had been in negotiations with the Export-Import (EXIM) Bank of China and we were very close to reaching a conclusion, so that was the brunt of our efforts at that time, culminating in the close of the loan in January 2011. Once the funding was in place, we had our ground breaking event in February and we immediately switched our focus to the non-core construction works–essentially getting the off site infrastructure in place so we could create the property boundaries for the resort. This involved moving government offices, three banks, the police and fire stations and completing the first segment of the re-routed West Bay Street. Q: How do you keep a project of this magnitude on budget? A: On a project of this size there are many variables. The actual construction will span almost four years. A lot can happen in the world economy in that time and so we’re constantly evaluating the impact of the commodity market on us here in Nassau. We constantly evaluate what we’re procuring, what the materials are and where they come from. We try to adjust our design where possible and always competitively source our material so we can get the best prices. It’s a constant process of managing budgeting overages or budget increase. One of the great advantages of Baha Mar is its sheer size; at 3.3 million sq ft we have great buying power, so we have materials that we’ll get competitive bids on from everywhere from North America to China and be able to get the best price. We buy many materials right here in The Bahamas–from the concrete blocks to the sand for the beach restoration, while retaining steel comes from North America and labour from China. It’s truly a global project. Q: With so many international elements involved in this development, how do you coordinate across the entire project? A: It is truly a 24-hour a day project–our lender and our construction company’s parent company are in Beijing; we have architects and designers in California, Dallas, New York and Chicago, among others. We run all that from here in Nassau. To coordinate everything, we use our data sharing base where we now have over 9,000 sheets of drawings, all posted on to what is essentially a massive website. All of our designers–at any given time–can bring up on their screen the exact drawing that everybody else is looking at. It’s not uncommon for the team here to have conference calls at 9pm, which for the lender is 9am the next day and at any point in between for the architects and engineers. We do most of our design reviews on screen instead of using traditional drawings. It just wouldn’t be cost-effective to be flying people across the country and around the globe all the time. You end up having to do it every couple of months, because you do need that face-to-face time, but you couldn’t do it every other week. Q: How is the work on site progressing? A: It’s been fantastic to see the change of the landscape, big and small. If you look at the superstructure, we’ve poured more than 30 per cent of the concrete, with the casino tower reaching more than 100 ft. To have got this far this quickly most of the time crews are working 24 hours a day, in two and three shifts around the clock. They work around weather. They are a very resourceful group. Q: Baha Mar is a single phase construction project. Did you ever consider that a phased approach might have been more efficient? A: It is absolutely essential that Baha Mar is completed in one single phase. I think we went through a period in the resort development industry in the late 1990s and early 2000s where a lot of projects were only partially completed. They promised a golf course, or some other amenity in the future, and it never came to fruition. We are very fortunate that the vision of our owner and the support of both our lender and the construction group have afforded us the ability to present all of Baha Mar in a single grand opening vision. Everything from the choice of four hotels to the largest casino in the region to the conference centre and the golf course will be ready on that day. So, whether you are the first guest or the hundred thousandth guest, everybody will get the full impact and full Baha Mar experience from day one. Q: How is this development different from other projects that you have overseen? A: One of the things that resonates with me is the project’s authenticity. Many resorts are created in a generic location and so you have to invent architecture, or a period of time, or invent a place to define the brand. We don’t have to do that. What makes Baha Mar and The Bahamas magical is that it is a truly authentic place. The views are endless. It’s absolutely beautiful every day. So, right off the bat, we don’t have to create a setting for it. When you build these great resorts and it’s kind of like building a stage set; then you have to have the performers to perform on it. One of the greatest things that we have going for us is that we are in a location where the people have been in the hospitality business for a long time and understand the importance of our guests having a wonderful time and coming back. Q: What makes this project stand out from other mega-resorts in the region? A: For properties to be truly world-class everything has to come together to make it perfect. Our situation in The Bahamas is that the government has nearly completed the $400-million redevelopment of the airport and a $75-million highway leading from the airport to Baha Mar–so it will take 12 minutes to get from the airport to here. We have new infrastructure, increased airlift and transportation. With that level of public infrastructure and private investment I believe Baha Mar and The Bahamas’ are perched to hit a home run when we open in 2014. Q: What will be your key markets once the resort is open? A: If you look at Nassau, currently 80 per cent of visitors come from the US, 10 per cent from Europe, and 10 per cent from Canada. What you will see is improved airlift from these markets and the introduction of airlift from China. US domestic carriers will see the additional demand from Baha Mar and all tides will rise. We are pursuing all avenues and in conjunction with the Ministry of Tourism we are building awareness and visibility of The Bahamas and the Baha Mar brand across Latin America, Europe, and Asia. Q: How will you position yourself in relation to The Bahamas’ other major resort offering, Atlantis Paradise Island? A: Atlantis is a fanciful and heavily themed resort. We’ve purposefully designed Baha Mar–from the interiors, to the exteriors, to the amenities–to create our own identity and support our own vision. It’s one that will be complementary to Atlantis. At the end of the day, our sincere wish is that we are both successful.